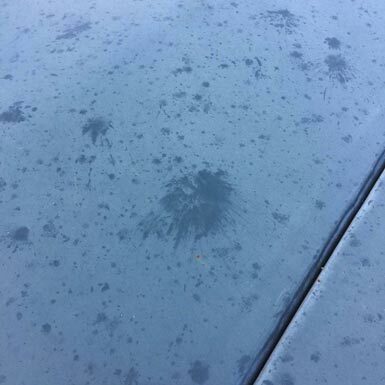 What is actually is hail damage? With the storms that came through our area on July 21st, it’s likely that you’ve heard there was hail in the area. Hail can come in many shapes and size but any way about it, it can still damage your roof. So with that being said, your probably wondering how hail damages your roof. To best answer that question we need to start with what shingles are made up of. What are shingles made of? Composite shingles are made out of three main components: fiberglass, asphalt, and granules. It all starts with the fiberglass mat, which is the base layer of the shingle. The fiberglass is then soaked in asphalt then covered with small stones known as granules. The top layer of granules is the first line of defense on your roof. They protect from UV rays and impacts to the roof. Whether it be hail or any other impact, the granules take that hit to keep from damaging the decking on the roof. Other types of shingles such as wood shake roofing, metal roofing, or tile roofing are very durable but can also be affected by hail. If the hail is large enough it can cause shingles to bust and dent metal. Where does hail come from? According to the NOAA, hailstones grow by colliding with supercooled water drops. Supercooled water will freeze on contact with ice crystals, frozen raindrops, dust or some other nuclei. Thunderstorms that have a strong updraft keep lifting the hailstones up to the top of the cloud where they encounter more supercooled water and continue to grow. The hail falls when the thunderstorm’s updraft can no longer support the weight of the ice or the updraft weakens. The stronger the updraft the larger the hailstone can grow. So how does hail damage your roof? Depending on the size of the hailstones, they can fall anywhere between 20/mph and 110/mph. 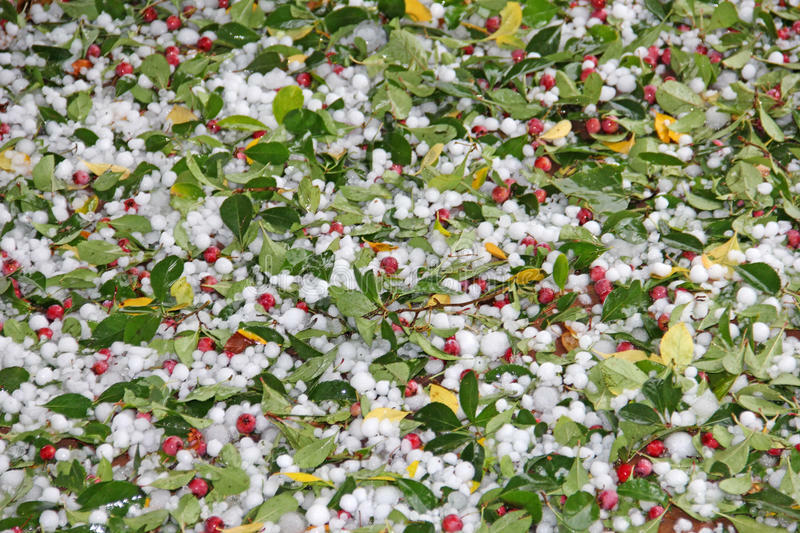 The larger hailstones travel faster than the small ones so they tend to do more damage. When hail starts hitting your roof, the granules take that direct impact. As the hail hits it starts knocking off granules exposing the fiber glass mat. Once they start hitting the fiberglass mat then its essentially making direct contact with the decking of your roof leaving your roof exposed to mother nature. The loss of granules greatly decrease the life and integrity of your roof. Soft metals such as the tops of air conditioning units mailboxes are an excellent way to identify you’ve had hail without having to actually get on your roof. You will see dents or “spatter” which can be seen in the above picture. If your yard is a mess after a storm, this could be an indicator of hail damage. Look for leaves with holes and check out shrubs to see if they were damaged. 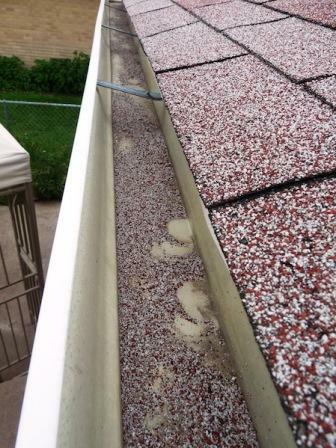 Your gutter can tell you a lot about the loss of granules and whether or not you’ve been affected by the storm. You can check your gutter downspouts for a couple of things that can identify if you had damage. First check to see if they’re dented. Next look to see if there are a lot of granules coming out of your downspouts. You can also check the gutters themselves to see the amount of granule loss. The best way to know whether or not you have hail is to have an inspection done. There will be a lot of contractors coming out of the wood works that are what we call “Storm Chasers”. Most of the time they are from out of state. If you feel like you have had hail damage at your home, reach out to us an schedule a free inspection with a company you can trust. Click the link below to contact us!